BENTONVILLE, AR. 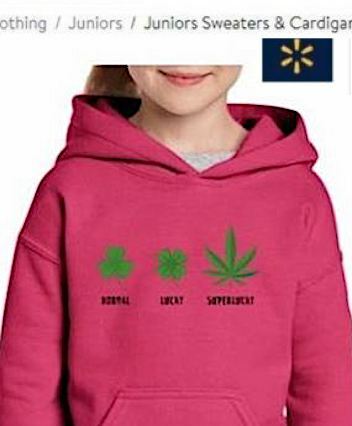 (THECOUNT) — Walmart.com featured many outfits in the spirit of the St. Patrick’s Day holiday, but never did many Walmart shoppers expect to see the retail giant offering a hoodie for children boldly featuring a marijuana leaf. Our friends at LasVegasNow say a viewer narced out Walmart directing them to curious piece of clothing for sale on their website featuring images of a three-leaf clover, a four-leaf clover, and a pot leaf. TRENDING: Did Fox News Show 'Justice With Judge Jeanine' Get Canceled? In the screen capture of the point of sales page, which was since removed but not before being widely shared on social media, depicts a young girl wearing a bright pink pullover which reads, “normal, lucky, super lucky,” the ‘super lucky’ positioned below the marijuana leaf, LasVegasNow reported Sunday. LasVegasNow say they examined the link the viewer sent them and it appeared to land on the official Walmart.com site. All of the tabs are functional, including the cart option for purchases, and when signed in to an account the user’s info appears in the upper-righthand corner. By all indications the sweater is a Walmart item, but when we reached out to Walmart.com for comment they knew very little about the item, reported LasVegasNow Sunday. “This isn’t an item sold on Walmart.com and we will alert the IT team to remove the image and/or page immediately,” a Walmart.com supervisor stated. As of right now, the page and the link are still functional but the item is no longer available for purchase..
What do you think? Is this Okay? Comment your thoughts below and share this post on social media with your family and friends!